Imagine you are new to cricket and you see the ball crossing the boundary. The camera switches and you are greeted to the sight of the official swinging his arms around his waist like a madman. It might lead you to think that he is engaging in some medieval dance whilst in reality he is just indicating four runs. That’s why; to understand and enjoy the game to the fullest, it’s of utmost importance that you understand the signals that the referees make on the field. With American football hitting Indian shores in the form of EFLI, here’s a helpful guide that will enable you to understand the signals in an American football game, so that you end up enjoying the game to the fullest. Like any other game, the people conducting the game (called referees in American Football) have a huge role to play. The officials/referees work in group of seven in the game with each of them having a specific duty and a specific name: referee, umpire, head linesman, line judge, back judge, side judge, and field judge. 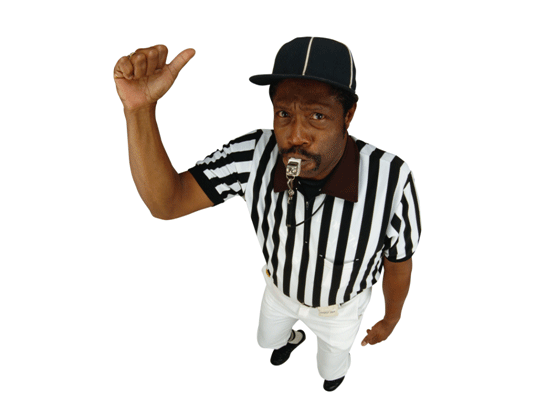 The referee, who is the person responsible for general supervision of the game, is also known as head referee or the crew chief. Both arms extended above head. A team scores what is called a touchdown, when it succeeds in getting the ball into the end zone of the opposition. On achieving the feat, the team is awarded six points. A touchdown can be scored either by catching the ball in the end zone or running past the goal-line and into the end zone of the opposition. A field goal is usually attempted on a fourth down if the kicker is close enough to the end zone to kick the ball through the posts. This will garner the offensive team, three points. The offensive team may attempt to kick the ball through the goalposts, in the same manner that a field goal is kicked. If the team is successful in doing so, they are awarded one point, referred to as an extra point. A much riskier option is what is called a two-point conversion. The offensive team may attempt to advance the ball via run or pass into the end zone, much like a touchdown on the extra-point attempt. This high risk maneuver is only attempted when two points will help the team but one point will not. The offensive team (team with possession of the ball) is tasked to move the ball forward in segments of at least 10 yards. They will get at least four chances (or downs) to gain these requisite 10 yards. Every time the ball is advanced at least 10 yards within their allotted four chances, another first down is earned, with four more chances to go a further 10 yards. Loss of a down occurs when the offence is charged with a penalty. Penalties are enforced when a foul (violation of the rules) committed by either of the team. Some fouls committed by the offence may result in loss of a down (loss of the right to repeat the down). Such penalization is made only on certain occasions like an illegal forward pass or intentional grounding (more on these in the following article). Thus if the penalty happened on 1st down, the next play would be 2nd down. In American football, a movement by any of the players of the offensive team (other than the centre) after he has taken a set position is deemed as a false start. The rule is most stringent for offensive linemen. A movement of only couple of centimetres for the linemen can draw a penalty of a false start. This is done so as to prevent the offensive players from unfairly drawing the defense offside. A penalty of five yards is given for a false start. 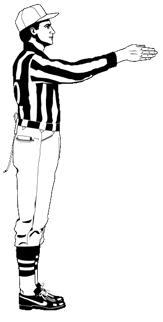 The signal is the same as that of a false start; however the referee will make it clear that this signal is being made for an illegal formation vocally. The referee calls a formation “illegal” if the offense it fails to line up according to specific guidelines. A penalty of five yards is given for an illegal formation. There are several ways of lining up that may lead to an “illegal formation” penalty. For example, if less than seven players line up on the line of scrimmage, having eligible receivers who fail to line up as the leftmost and rightmost players on the line or having five properly numbered ineligible players fail to line up on the line. Time Outs in football are taken in American football comprises a major part of team strategy. A time-out is generally called in order to stop the game clock (which otherwise keeps on running between plays) and discuss strategies in-depth for a team. A time out can be called by either a player (normally a quarter-back) or the head-coach. Each team is restricted to calling three-timeouts each half. In American football, a touchback occurs when the ball turns dead on or behind a team’s own goal line due to the opposing team giving the ball the momentum, or impetus, via a kick, pass, fumble, or in certain instances by batting the ball to travel over or across the goal line. A touchback generally ensues a kick return or a punt when the kicker/punter kicks/punts the ball to send it out of bounds behind or over the receiving team’s goal line. Following a touchback, the team awarded the touchback receives possession of the ball at its own 20-yard line. Delay of game is called in which a player or team intentionally brings the game to a momentary halt, usually with the intention of seeking advantage from this slight delay. In American Football, this is considered as conduct unbecoming of a sportsman and hence is penalized. An offensive team is penalized five yards for delay of game if it fails to put the ball in play by either snap or free kick before the play clock expires. If a team has already used its quota of three time-outs in a half, they get an excessive “fourth timeout” if one of their players end up injured. However, any subsequent injuries after the fourth timeout result in a five-yard delay-of-game foul. In addition to an excessive timeout, there is a 10-second runoff (if it was an offensive player that was injured) or the play clock is reset to 40 seconds (if it was a defensive player). Exceptions to the above rule include if the other team called a timeout immediately after the previous play to save time on the clock; the injury was caused by a foul by an opponent; or the previous play resulted in a change of possession, a successful field goal, or was a conversion attempt. These should be enough for you as your first dose in the introduction to signals that you will see an American Football referee make on the field. You can read about more such signs in the second part of this series here.